Sick or not, there has been work to be done. I've kept busy powered by gallons of hot tea. I was finally able to get started on some new ornaments. I wanted to share the first photos with you, since I am just so thrilled how these turned out! 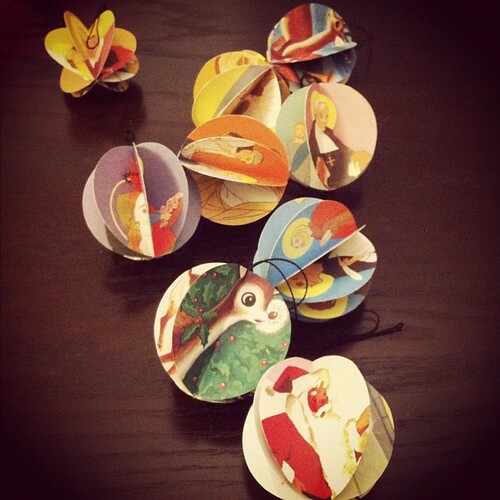 I made ornaments out of vintage book pages. 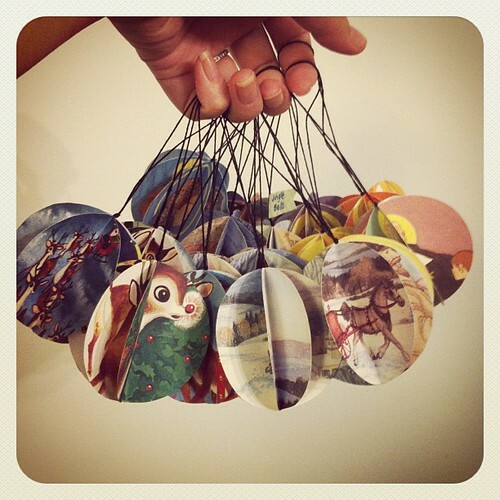 I've had the heart-shaped ones available in the shop for a few weeks, but these round ones are completely new. These are actually the first ones I've made! I love the heart-shaped ones, but these... I'll have a hard time selling these guys, that's how much I love them! I think Chris put it well when I showed him the first ones I made last night. He said it looks like every one of the panels has a little scene or story to tell. I used three books for these ones. There's Rudolph the red nosed reindeer, Jingle bells and a Child's book of the saints. They all had amazing illustrations and I love how they turned out! I'm setting up my gear shortly to start taking photos of them, so they'll be available in the shop very soon! And a hello to you too! Thank you so much for your kind words. Let me tell you, you just made my day AND made me blush at the same time. So, thank you! Hope to see you around!